A variation on the classic recipe using egg batter rather than dipping in masa flour. The chile relleno (Spanish pronunciation: [ˈtʃile reˈʎeno], literally "stuffed chile") is a dish of Mexican cuisine that originated in the city of Puebla. It consists of a stuffed, roasted, fresh poblano pepper (a mild chili pepper named after the city of Puebla), sometimes substituted with a non-traditional Hatch chile, Anaheim, pasilla or even jalapeño chili pepper. In its earliest incarnations, it was described as a "green chile pepper stuffed with minced meat and coated with eggs". 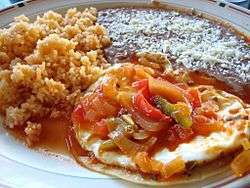 In current cuisine, it is typically stuffed with melted cheese, such as queso Chihuahua or queso Oaxaca or with picadillo meat made of diced pork, raisins and nuts, seasoned with canella; covered in an egg batter or simply corn masa flour and fried. Although it is often served in a tomato sauce, the sauces can vary. Some versions in Mexico use rehydrated dry chiles such as anchos or pasillas. In the United States, chiles rellenos are usually filled with asadero, asiago, or Monterey Jack cheese, but can also be found with cheddar or other cheeses. The chile is then dipped in an egg batter and either pan-fried or deep-fried. Variations include pecan-encrusted and crab-filled. Chiles rellenos are a popular cuisine in the state of New Mexico, where the Hatch chile is revered for its slender (rather than round) shape and medium-to-hot flavor. 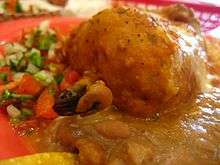 In the US, rellenos are typically served with red or green chile sauce or mole. A recipe from 1914 (as 'chili reinas') is published in a period guidebook to San Francisco restaurants. In Guatemala, the 'pimiento' pepper is stuffed with shredded pork and vegetables. As the Mexican version, it is covered with egg batter and fried. It is served with tomato sauce or inside a bread bun. 1 2 Velázquez de la Cadena, Mariano (1858). A dictionary of the Spanish and English languages. New York, New York: D. Appleton & Company. p. 96. ↑ Kenyon, Chelsie (2012-04-10). "How to Make Chile Rellenos". About.com. Retrieved 2013-01-07. ↑ Edwords, Clarence E. (1914). Bohemian San Francisco -- Its Restaurants and Their Most Famous Recipes. San Francisco: Paul Elder and Company – via Books about California History and Culture.